I am all about making new meals out of leftovers and creating no waste in the kitchen. Last week, I made a delicious slow cooker buffalo chicken with just three ingredients. I used three boneless, skinless chicken breasts, a cup of Frank’s Red Hot Buffalo sauce, and a tablespoon of butter. That was it! The chicken cooked low and slow for about six to eight hours. Then, I shredded it up and served it with a roasted garlic quinoa. It was so good! The only problem with this dish was that it made so much for just two of us! But we made good use of the leftovers. Friday night is pizza night in our house. I made a buffalo chicken pizza with sauce, some of the shredded buffalo chicken, and a blend of mozzarella and blue cheese. I served it with Ranch dressing on the side. It’s definitely a pie I’ll be making again! There was so much buffalo chicken left over that I even managed to make one last meal. I love Buddha bowls! They’re a great way to eat healthy grains, veggies, and protein all in one dish. You might remember the Greek Goddess Buddha Bowl I made not too long ago. Since I also had a lot of quinoa leftover, this Buddha bowl recipe was born! Add chicken, Buffalo sauce, and unsalted butter to a slow cooker. In a bowl, arrange ingredients separately. Add quinoa, buffalo chicken, and cauliflower on one side of the bowl. Then, arrange spinach on the other side. Add in the red onion and spoon the blue cheese onto the middle of the bowl. Drizzle with Ranch dressing, if desired. We love Buffalo everything in our house, so the amount of chicken that the slow cooker recipe made did not go to waste. With slow cooker season up ahead, this is a simple Buffalo chicken recipe to have on hand to warm you up on a cold night. Serve the chicken as a Buffalo taco, inside a wrap, or – of course – this colorful Buddha bowl! This Buddha bowl packs just the right amount of kick with a good source of protein, grains, and veggies. There’s a great variety of textures from crunchy to creamy and a flavor range of subtle, spiciness and a bit of tang. 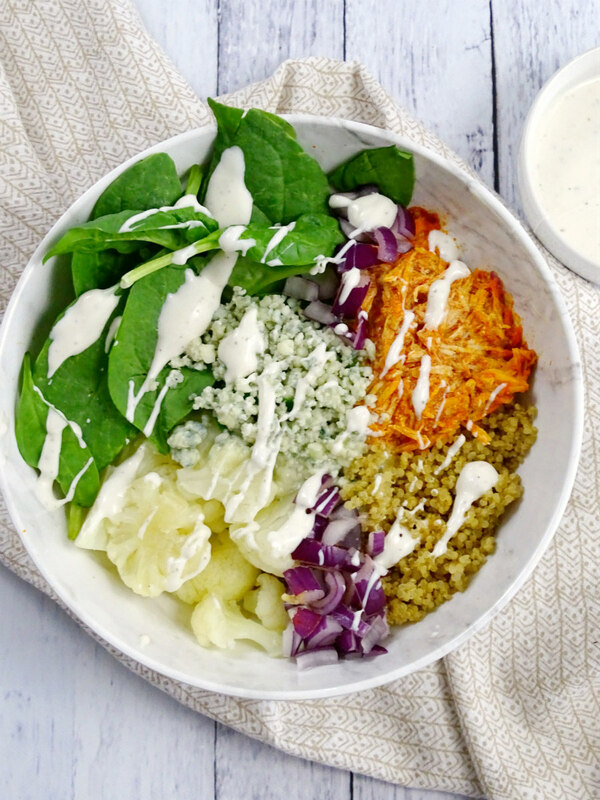 If you love Buffalo flavored everything like we do, this is the perfect Buddha bowl for you! What’s your favorite Buffalo flavored dish? This sounds amazing! I have a similar buffalo chicken recipe and I’m totally going to use the leftovers to make this for work lunches! “Bowls” seem to be the in dish for foodies everywhere. So, why haven’t I made one yet. 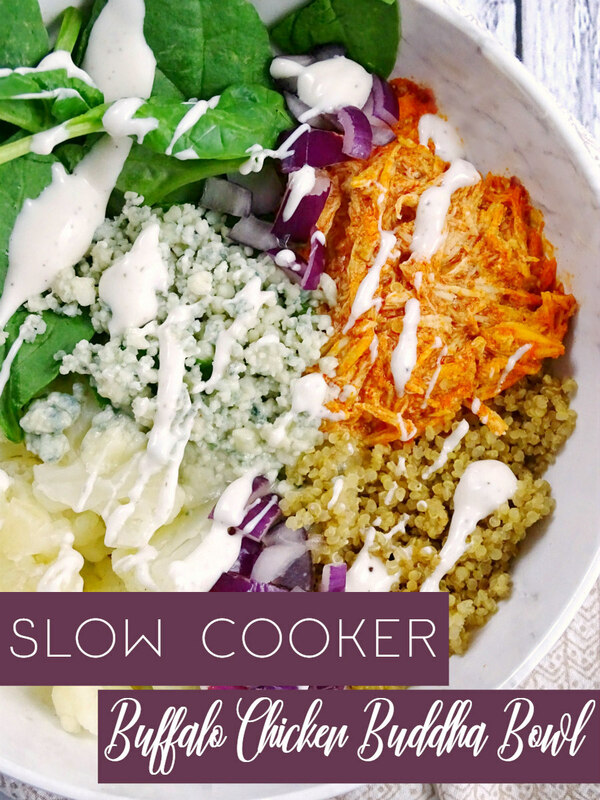 Love all the flavors, the simplicity and you use a slow cooker – a favorite appliance. Thanks for sharing with Fiesta Friday and enjoy your weekend. Bowls are such a great way to use up leftovers and make a flavorful meal. They’re even better when you can make them with a slow cooker! I hope you enjoy this recipe! 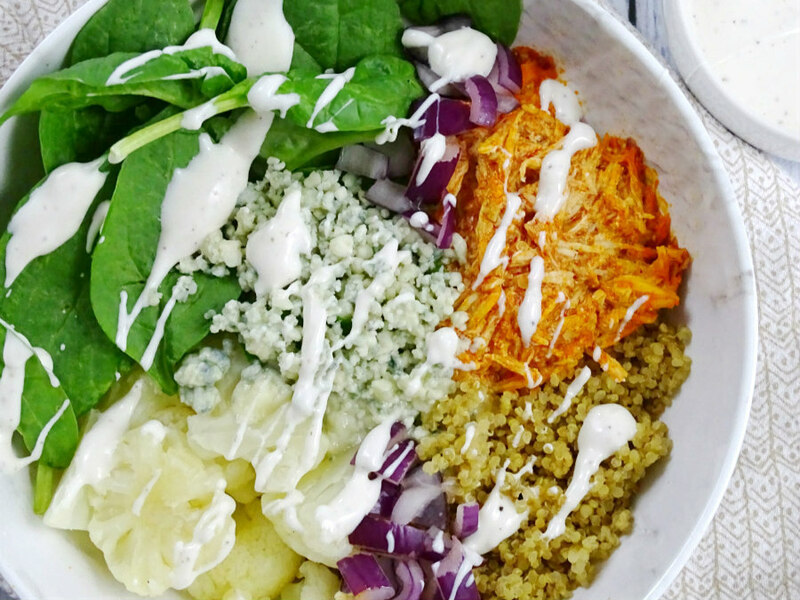 Your Buffalo Chicken Buddha Bowl will be delicious. Thanks so much for sharing with us at Full Plate Thursday. Have a great weekend and come back to see us real soon!